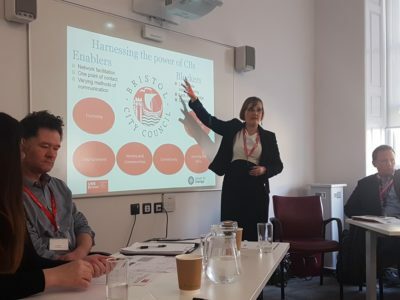 Suzanne Perry, Power to Change Research Officer, and Mandy Gardner, Power to Change’s first grant funded PhD candidate at University of West of England, share their experience of Bristol Forum, held on the 29th March at Bristol City Hall. Inspired by the One City Approach, the Forum brought together communities, researchers, businesses and civic leaders across the city to address various challenges. Drawing on her research Mandy hosted a session on the day which centred around the potential for community businesses to contribute to Bristol’s One City Approach. The scene was set with an address from Mayor of Bristol, Marvin Rees, Vice Chancellor of Bristol University, Hugh Brady, and Deputy Vice Chancellor of the University of West of England, Professor Jane Harrington. All three spoke about the need for organisations to work together as a city to make change. 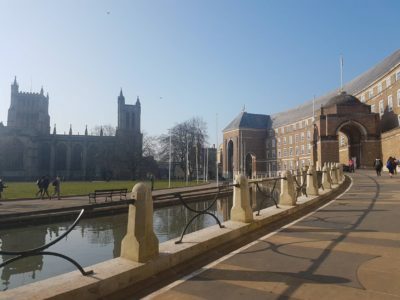 They noted that the quality of conversations between City Hall and the two universities is unique to Bristol and hard to achieve elsewhere. Crucially, Jane Harrington reminded us that one of the key themes that delegates wanted to discuss during the day was place-based leadership. BBRC’s Edward Rowberry further spiked enthusiasm in the room when he spoke about City Funds, a one stop, locally-led, place-based community fund, starting with an initial £10 million. The aim of the fund, due to launch in July, is to make meaningful and strategic change for all in the city to thrive. Power to Change are in talks with BBRC and other investors about how we might best contribute to City Funds to grow the community business sector. In particular, we are supporting development of City Funds’ Community Initiatives strand to help communities take on fixed assets, and are identifying opportunities for aligning PTC funding with City Funds, such as through our new £4.2 million Homes in Community Hands. Jari Moate of Resonance was up next with the positive news that they have invested £1.2m into Bristol enterprise growth since 2010. Their primary focus has been on assets, and how this can create stability to move away from grant reliance – something that has recently been reiterated for Liverpool, another of Power to Change’s priority places. Triodos’ Richard O’Brien highlighted that the bank has made 36 business loans in Bristol. He spoke frankly about the ways in which the parameters for finance are often set by the financers. A more useful way, he says, is for communities to be able to articulate and approach funders about what kind of finance they need. In addition, Richard is keen for the One City Approach to be revised, to focus not just on growth in the City but also on the benefits of the circular economy. 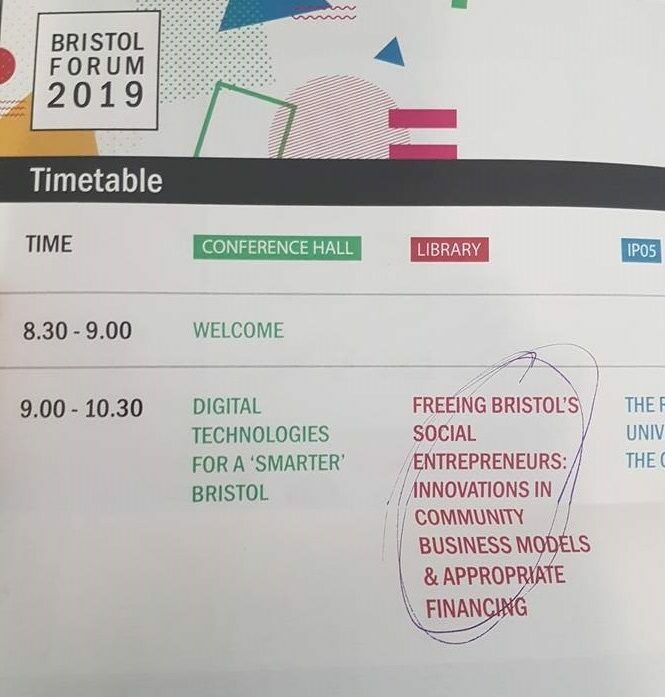 Amongst other great sessions during the day, Locality’s Paul Hassan’s, entitled ‘Communities and the One City Approach’, talked about how, despite the many challenges Bristol faces, community businesses are doing so much great work across the city. For example Power to Change grantees Up Our Street and Windmill Hill City Farm both spoke about their work, from newsletters to community networking events through to social care and running a café. They also drew on the challenges they face in terms of being able to meet the needs of a community with an ever-changing demographic, especially when resources for researching what the community needs is limited. Like Jari in the session before, Paul made the point that assets and asset transfer are often crucial for community businesses to thrive. Local authorities can, through asset transfer and other means, become enablers of these great businesses. Based on the discussions we both had during the day, we identified a key theme that needs addressing: resources need to be pooled to enable community businesses to flourish. For example, there was real appetite amongst those in Mandy’s session for a front desk style portal which houses all potential funding and finance opportunities for community businesses and the rest of the social economy. This could cater for the diversity amongst community businesses by having a matrix function, enabling users to find a resource or a mixture of resources which are best suited to them. Similarly, in the ‘Communities and the One City Approach’ session, an idea grew around the matching and pooling data resources. This was predicated on the fact that communities have data to share which universities may find useful and vice versa. This could involve having a managed website that enables community organisations, as well as universities, to upload their data as well as providing a link to other publicly available sources. Although it was unclear whether our feedback would be collated and fed back to the One City Approach conveners, we enjoyed talking about community businesses, their leaders and the ways in which they can collaborate with local authorities, the universities and businesses in the city. We, at Power to Change, look forward to playing a key role in the progress of Bristol’s communities in the years to come.